The Civilization III Diplomacy Editor allows you to change the text that is displayed when you are engaged in diplomatic meetings during gameplay. This editor provides a graphical tree for entering AI responses based on a Civ's name, power, mood, as well as random responses. Installation is easy. Just download the Zip file. Unzip it to a temporary folder, and run setup.exe. Follow the on-screen instructions. When the program starts you are asked for the path where Civilization III is located. Enter the path and click OK.
You edit the text by choosing a game message from the list on the left side of the window. It's properties appear on the right side and a graphical tree of dialog messages appears. Click on the text in the tree and type a new message to edit it. When you close the program, you are asked if you want to save the file. If you click yes, a back up of diplomacy.txt is created and saved as backup-diplomacy.txt. 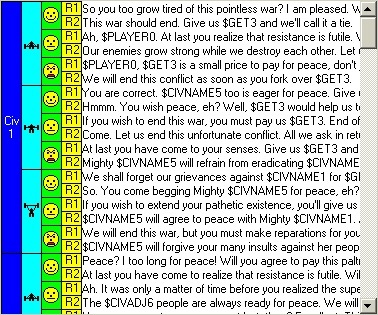 If your Civ III program does not function correctly after using this editor, simply copy the backup file over the edited diplomacy.txt file. Main Screen The Civ III Great Books Editor allows you to easily change the "Great Books" dialog that pops up when you play Civilization III. 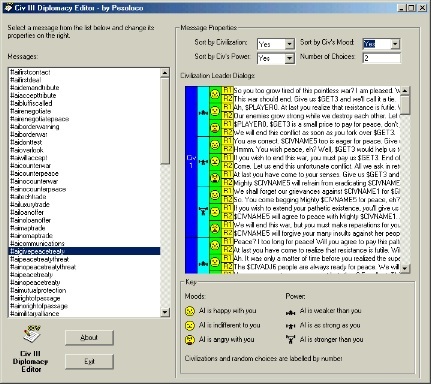 The editor makes it easy to change which advisor gives the message, the advisor's mood, the caption, and message text. The editor has an easy-to-use interface for adding and removing authors. The editor even allows you to change the titles of the books and the rank names. nstallation is easy. Just download the Zip file. Unzip it to a temporary folder, and run setup.exe. Follow the on-screen instructions. The program's interface is easy-to-use. Use the advisor combo box to choose an advisor for the message. Then use the mood combo box to select the advisor's mood. Use the Caption and Text textboxes to change the caption and message text respectively. You can an author by clicking "Add Author" and typing his name or remove an author by selecting it in the list and clicking "Remove Author." Use the Title text boxes to edit the book title names. Along the bottom of the window are the rank text boxes. Use these text boxes to edit the rank names that are used when the game rates the top 8 civilizations. To exit the program, click on Exit. You will be asked if you want to save. Click on Yes to save your changes. Be advised that this program does not automatically make a back-up of the Great Books.txt file. It is recommended that you back-up this file before using this utility.